Los Angeles, April 16: "Game Of Thrones" season eight premiered to record numbers in the US, HBO has announced. According to figures released by HBO, the season eight premiere drew 17.4 million viewers across all platforms (linear, HBOGO and HBO NOW), including 11.8 million who watched on the linear channel, reports variety.com. The number of viewers are expected to go up considerably once delayed viewing is factored into the final numbers. Game of Thrones 8: Hilarious Video of Euron Greyjoy Mimicking Shah Rukh Khan’s Iconic ‘Palat, Palat, Palat’ Dialogue to Cersei Lannister Goes Viral. The season seven premiere, by comparison, averaged 16.1 million total viewers, including 10.1 million who watched on the linear channel and the rest coming from DVR and streaming. That also beats the previous series high of 16.9 million multi-platform viewers for the season seven finale. However, the season seven finale drew 12.1 million linear viewers, meaning this season's premiere was down slightly in that measure. Game of Thrones Spoilers without Context: Internet Comes Together for Inside Jokes on Jon Snow and Daenerys Targaryen – Read Tweets. The last season premiered internationally on April 14. It will air in India on Star World on April 16. 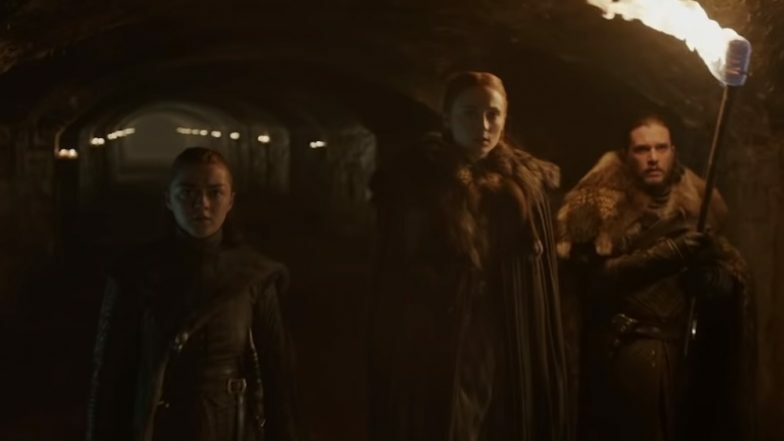 In addition, HBO NOW saw a jump of approximately 50 per cent in viewing when compared to last season's finale and a 97 per cent increase when compared to the seventh season premiere. It also accounts for largest night of streaming activity ever for HBO. The season eight premiere was also the most-tweeted episode in series history with more than five million tweets on Sunday alone.